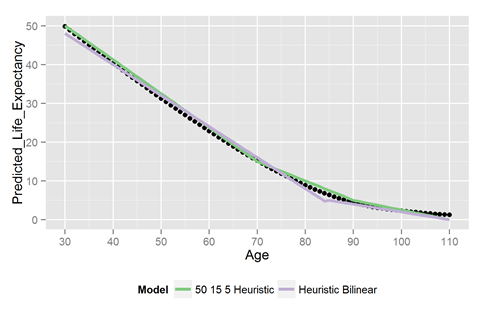 1) The heuristic bi-linear model. We made this by making the best bi-linear model a bit simpler to apply. If you’re under 85, your life expectancy is 72 minus 80% of your age. The life expectancies of 30, 70, 90 and 110 year olds are about 50, 15, 5, and 0. For more, check out the link. This entry was posted in science and tagged aging, longevity, models, oldage, predicting, science. Bookmark the permalink.